45 Drives is a company that takes storage very seriously and has a lot of fun doing it. You should know that from their interactions with us. Our Storinator is loaded up with a full 45 drives and is at the heart of the Geek House datacenter. But what if you want 45 Drives and don’t need, well, 45 drives? The company has expanded their lineup with 3 new models to go alongside their original Storinator S45: the Storinator Q30, S45 Lite, and even more extreme XL60. The Storinator Q30 is the “Baby” of the 45 drives lineup. The Q isn’t pulled out of a hat, it stands for quiet. That makes it ideal for office environments. The Q30 offers 270TB of storage using 8TB drives. Like its big brother the S45, it comes standard with twin gigabit Ethernet ports and has 10GbE as an option. Customers have the option to customize the Q30 to meet their specifications. Next up is the Storinator S45 Lite. This unit is much like the original S45, but in a more affordable package. It includes only a single 40-port Rocket 750 HBA card where the regular S45 line comes with twin HBA cards. 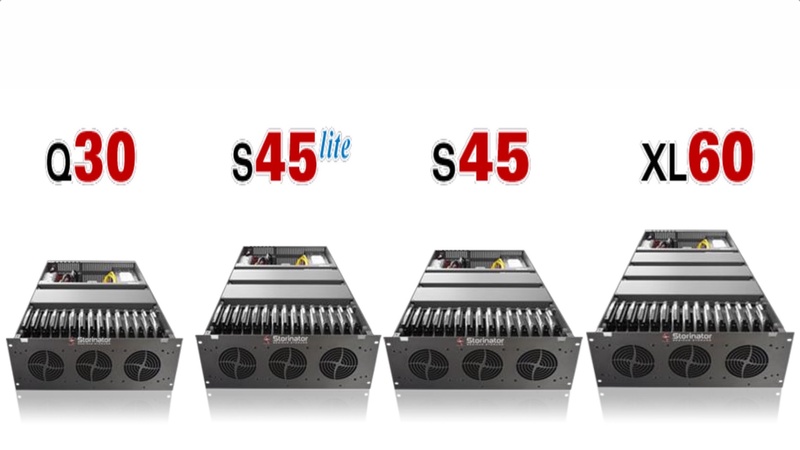 The S45 Lite and Original S45 can handle up to 360TB of storage. Prices start at $3220 for the S45 Lite and $5403 for the S45. Lastly, is the new alpha dog of storage, the Storinator XL60. Like its name suggests, the XL 60 is big, bad, and can hold 60 drives. That’ll add up to a maximum of 480TB of storage. It features redundant boot drives and ports, and comes standard with not only twin Gigabit ports, but a twin-port 10 GbE NIC as well. These are designed for the businesses with the most demanding storage needs. Pricing on the XL60 starts at $6800.